Background and objectives There are a limited number of publications on the features of arteriovenous graft infection in hemodialysis patients. The authors compared the clinical presentation, complications, and outcomes of infections of thigh and upper extremity grafts. Design, setting, participants, & measurements The authors queried a prospective access database at a large university medical center and identified 132 patients with graft infections (40 in the thigh and 92 in the upper extremity) requiring surgical excision. The authors collected information regarding the microbiology, complications, and clinical outcomes. Results The two graft groups were similar in age, gender, race, and frequency of diabetes. The median age of infected grafts was 162 days for thigh grafts versus 168 days for upper extremity grafts (P = 0.35). Thigh graft infections were more likely than upper extremity graft infections to be caused by a Gram-negative rod (31% versus 4%; P = 0.003), and more likely to result in a metastatic infection (15% versus 3%; P = 0.02). 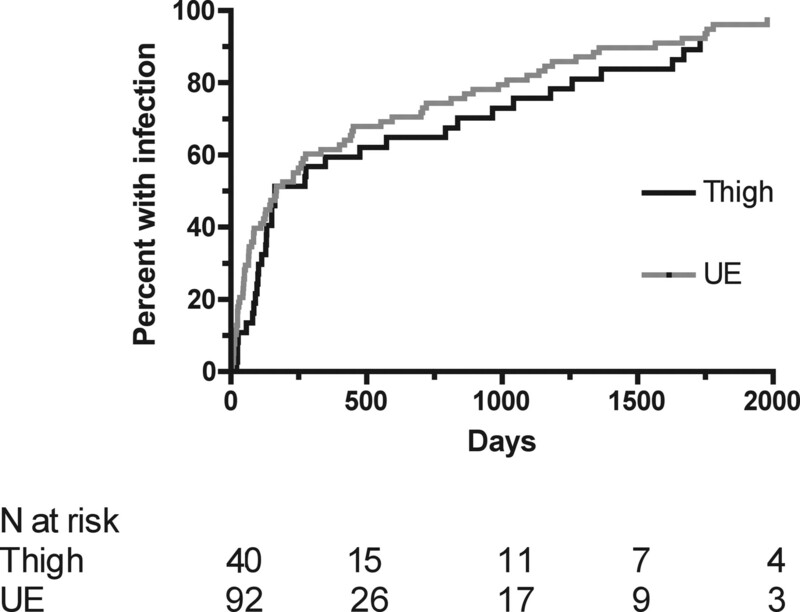 The duration of hospitalization associated with graft infection was similar (10.8 ± 5.4 versus 8.7 ± 6.3 days; P = 0.09). Finally, median catheter dependence was longer after thigh graft than upper arm graft infections (319 versus 237 days; P = 0.04). Conclusions As compared with upper extremity graft infections, thigh graft infections requiring excision are more likely to be caused by Gram-negative bacteria and to result in serious metastatic complications. These differences may require different empiric antibiotics and a higher index of suspicion for infection in hemodialysis patients with thigh grafts. The Kidney Disease Outcomes Quality Initiative Vascular Access guidelines (1) and the Fistula First Initiative (http://www.fistulafirst.org) both strongly promote preferential placement of arteriovenous fistulas, rather than grafts, in chronic kidney disease patients. Adherence with these guidelines has resulted in a progressive increase in fistula use and decrease in graft use in the U.S. hemodialysis population. Nevertheless, approximately 20% of the 400,000 U.S. hemodialysis patients continue to dialyze with grafts (2). In patients who have exhausted all options for an upper extremity fistula or graft, placement of a thigh graft is a viable option (3,4). Although thrombosis is the most common complication of grafts, infection is also relatively frequent, affecting 9% to 20% of grafts (5–11). Graft infections can result in long hospitalizations, serious complications, and prolonged catheter dependence (12). Although infection is more common with thigh grafts than upper extremity grafts (3), it is unknown whether the clinical presentation or outcomes of graft infections differ between the two graft sites. To address this question, we queried a large prospective, computerized vascular access database to identify all graft infections during a 9-year period. We compared the timing, microbiology, complications, and clinical outcomes of graft infections in the thigh with those affecting upper extremity grafts. The University of Alabama at Birmingham (UAB) provides medical care to approximately 500 in-center hemodialysis patients at 5 hemodialysis units in metropolitan Birmingham. These patients have their medical care supervised by clinical nephrologists at UAB, and >95% of their hospitalizations are at UAB Hospital. Four experienced transplant surgeons place new vascular accesses and revise them as needed. UAB radiologists perform preoperative vascular mapping, as well as percutaneous access interventions. The access surgeons determined the type and location of vascular access on the basis of their clinical examination and review of the preoperative vascular mapping. Upper extremity grafts were placed in patients judged to be at high risk for fistula failure. Thigh grafts were created in patients who had exhausted all options for an upper extremity access, provided that the preoperative evaluation did not indicate significant arterial calcification or peripheral vascular disease. New grafts were cannulated with 15 gauge needles about 2 to 3 weeks after their creation, provided that there was no evidence of thrombosis, edema, or infection. The skin overlying the graft was cleansed with an iodine-based or alcohol-based antiseptic solution before each cannulation. Graft infection was suspected if the skin overlying the graft was red, tender, or warm; if there was purulent drainage; or if the patient had a fever. The infection surveillance protocol was similar for upper extremity and thigh grafts. Empiric intravenous antibiotics were initiated in patients with suspected graft infection after obtaining blood cultures. If the infection failed to respond to antibiotic therapy, the patients were hospitalized and the surgeon excised the graft. Wound cultures were obtained at the time of surgery. The surgical wound was left open and allowed to close by secondary intention. Metastatic complications were suspected in patients with persistent fever or bacteremia despite graft excision and antibiotics. Appropriate studies, including echocardiography, computed tomography, or magnetic resonance imaging, were performed to evaluate such complications. Patients with uncomplicated graft infection received a 3-week course of systemic antibiotics, and those with metastatic infection were treated for 6 to 12 weeks. Tunneled dialysis catheters were used as a bridge access after excision of an infected graft, until a new access was ready to use. Two full-time vascular access coordinators scheduled all access procedures, tracked outcomes and complications, and maintained a prospective, computerized access database (13). Our local Institutional Review Board provided approval for retrospective review of existing medical records of patients with access complications. We retrospectively queried the computerized database to identify all (n = 1309) new arteriovenous grafts placed during a 9-year period (January 1, 2001 through December 31, 2009), including 1023 upper extremity grafts and 286 thigh grafts. There was no overlap between the grafts included in the present study and a previous graft infection study from our center (April 1, 1996 through September 30, 2000) (12), and mild overlap with another graft outcomes study we published (January 1, 1999 through June 30, 2002) (3). We then identified all patients with a graft infection. If a patient had more than one graft infection during the study period, only the first graft infection was included in our analysis. Only infected grafts requiring surgical excision were included in the database, and we did not collect culture data on grafts with suspected infection that did not require surgery. There were 132 patients with a graft infection, including 92 with an upper extremity graft and 40 with a thigh graft. The UAB electronic medical records were used to obtain clinical patient information, hospitalizations, and microbiology reports. Patients with infected thigh grafts and upper extremity grafts were compared by standard statistical tests. Unpaired t tests or the Mann-Whitney test was used to compare continuous variables and χ2 tests or Fisher's exact test for categorical variables. Kaplan-Meier survival curves were generated for time to graft infection and duration of catheter dependence after graft infection, with patient follow-up censored at the time of death, transplant, or transfer to an outside dialysis unit. The differences between the survival curves were analyzed using the log-rank test. A P value <0.05 was considered statistically significant. The proportion of new arteriovenous grafts developing infections was significantly higher for thigh grafts (40 of 286, or 14%) than for upper extremity grafts (92 of 1023, or 9%) (P = 0.01). Patients experiencing graft infection at these two sites did not differ from each other in terms of age, race, gender, or frequency of diabetes (Table 1). Graft infection was observed at a wide spectrum of time periods ranging from weeks to years, but the majority of infections occurred within 6 months of graft creation (Figure 1). The time to infection did not differ by graft location (P = 0.35 by the log-rank test), with a median of 162 days for thigh grafts and 168 days for upper extremity grafts. Time from graft creation to infection among patients with an infected thigh graft or upper extremity (UE) graft. The median graft age at infection was 162 days for thigh grafts and 168 days for upper extremity grafts (P = 0.35 by log-rank test). The surgical wound cultures were positive in 56% of patients (74 of 132) with graft infections, presumably reflecting prior antibiotic therapy (Table 2). The frequency of positive wound cultures was similar for thigh and upper extremity grafts (65% versus 52%; P = 0.19). Among those patients with positive wound cultures, only 31% (23 of 74) had concurrent positive blood cultures. This proportion tended to be higher for thigh grafts than upper extremity grafts (42% versus 25%), although the difference did not achieve statistical significance (P = 0.19). Among those patients with positive wound cultures, a higher proportion of patients with thigh grafts had Gram-negative infections (8 of 26, or 31%), as compared with patients with an upper extremity graft (2 of 48, or 4%). The odds ratio for Gram-negative infection in patients with a thigh graft was 10.22 (95% confidence interval [CI] 1.98 to 52.8) (P = 0.003 by Fisher's exact test). All patients with graft infections required hospitalization. The median duration of hospitalization was about 1 day longer for patients with thigh graft infection than for those with upper extremity graft infection, although this difference was not statistically significant (P = 0.07) (Table 3). Patients with a thigh graft infection were significantly more likely to have a metastatic infection. A metastatic infection occurred in 15% of patients with a thigh graft infection, as compared with 3% of those with an upper extremity graft infection (P = 0.02 by Fisher's exact test) (odds ratio 5.24; 95% CI, 1.24 to 22.1). Patients with a metastatic infection tended to be more likely to have had prior synthetic grafts (67% versus 39%; P = 0.16). The clinical presentations, diagnostic and therapeutic procedures, and clinical outcomes of patients with graft infection and metastatic infection are summarized in Table 4. All of the patients had either direct documentation of endocarditis by positive blood cultures and valvular vegetations by echocardiography or evidence of systemic or pulmonary septic emboli by appropriate imaging studies. Of note, all nine patients with metastatic infection had a graft infection caused by Staphylococcus aureus or Enterococcus. Three required valve replacement surgery, and three died within 60 days of the diagnosis. All patients required a tunneled hemodialysis catheter after removal of their infected graft. Once the surgical site of the excised graft had healed, most patients had one or more attempts at placement of a permanent access (fistula, graft, or peritoneal dialysis catheter), although these were not always successful. Overall, 53% (70 of 132) of the patients had a new dialysis access used after removal of their infected graft (Table 3). The next access was another graft in most patients, with a smaller number of patients using a fistula or peritoneal dialysis catheter. However, some patients had prolonged hemodialysis catheter dependence. The median duration of patient follow-up was similar for both groups (640 versus 578 days; P = 0.40). The median duration of catheter dependence after the graft infection was significantly longer for patients with an infected thigh graft (approximately 10.5 months), as compared with patients with an infected upper extremity graft (approximately 7 months) (P = 0.04) (Figure 2). Finally, patient mortality within 6 months of the graft infection occurred in 12.5% of those with a thigh graft and 11% of those with an upper extremity graft (P = 0.79). Duration of catheter dependence after a graft infection. The median catheter dependence was 319 days after a thigh graft infection versus 237 days after an upper extremity graft infection (P = 0.04 by log-rank test). The current study confirms the high morbidity and mortality associated with a graft infection. The adverse outcomes we observed included prolonged hospitalization, metastatic infections, prolonged catheter dependence, and a high short-term patient mortality. Previous publications have focused primarily on infections of upper extremity grafts. The present study highlights several important differences between thigh graft infections and those in the upper extremity. First, we have confirmed that thigh graft infections are more common than upper extremity graft infections, consistent with our previous finding (3). Presumably, this difference reflects their proximity to the groin, with the potential of the overlying skin to be contaminated by enteric organisms. This hypothesis is consistent with the observation that nearly one third of the wound cultures from thigh graft infections grew Gram-negative rods, whereas these organisms were rare (4%) in patients with infected upper extremity grafts. In our previous report of 90 graft infections, of which 87% were in the upper extremity, only 3% grew a Gram-negative rod (12). The low frequency of positive blood cultures among patients with infected grafts suggests that graft infections are primarily introduced from skin flora during cannulation of the graft for hemodialysis, rather than by hematogenous spread. A previous study reported a similar frequency of infections in thigh grafts and upper extremity grafts (17% versus 19%) (4), but the comparison was based on a smaller number of grafts than in the present study (201 versus 1309 grafts). We also observed a higher frequency of metastatic infections with infected thigh grafts, as compared with upper extremity graft infections. This difference suggests that there may be a delay in diagnosing thigh graft infection, perhaps because they tend to be deeper with more overlying subcutaneous tissue. As a result of the delay in treatment, they are more likely to result in systemic seeding. Although Gram-negative organisms accounted for nearly one third of thigh graft infections, only Gram-positive infections were associated with metastatic complications. The clinical burden resulting from graft infection was substantial, consistent with our previous report (12). It included prolonged (>1 week) hospitalization for surgical graft excision, systemic antibiotics, and postoperative care. It also resulted in prolonged catheter dependence, which was even greater for patients with thigh graft infections, presumably because they have fewer potential sites left for an additional dialysis access. Our study has several limitations. First, this was a retrospective analysis. However, the access procedures and complications were captured in real time by dedicated access coordinators, giving us confidence in the completeness and accuracy of information obtained. Second, this was a single-center study, and our results may not generalize to all dialysis centers. Third, because wound cultures were obtained after initiation of antibiotics, a subset of cultures was negative, and the microbiologic pattern of those infections may differ from the ones with positive wound cultures. Finally, we analyzed only infected grafts requiring surgical excision, so do not have information regarding graft infections that resolved with antibiotics alone. The observations from our studies have important clinical implications. First, antisepsis of the skin should be extremely meticulous before cannulation of thigh grafts to minimize the risk of infection. We used iodine- or alcohol-based antiseptic solution to cleanse the skin before graft cannulation. A meta-analysis of randomized controlled trials found that chlorhexidine was more effective than providone-iodine solution in preventing catheter-related bloodstream infections in the general population. Thus, use of chlorhexidine solution may decrease the frequency of graft infections (14). In addition, our results suggest that empiric therapy with vancomycin alone is sufficient for infected upper extremity grafts, whereas the addition of broad-spectrum Gram-negative coverage (aminoglycoside or third-generation cephalosporin) is required for infected thigh grafts. In summary, thigh graft infections occur more commonly than upper extremity graft infections. They are more likely to be caused by a Gram-negative rod and to result in a metastatic infection. 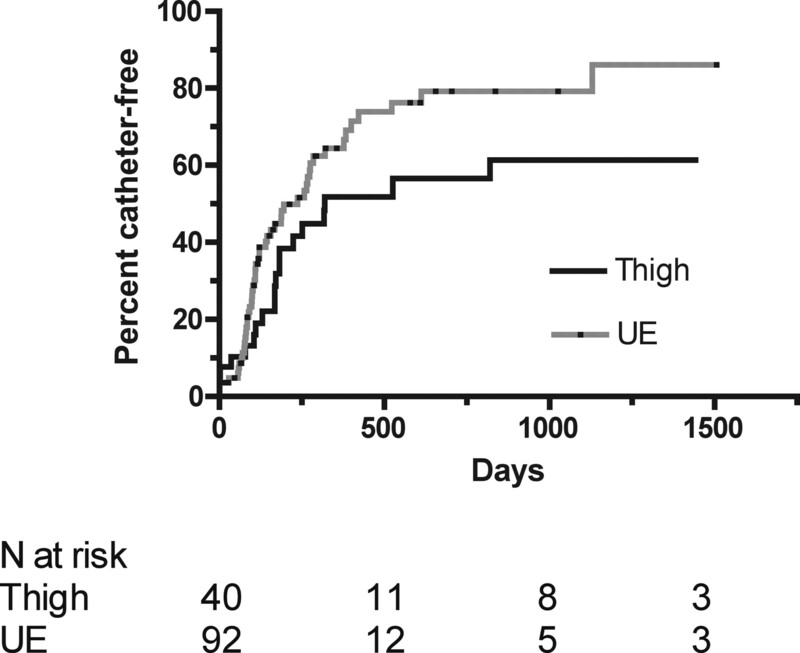 Moreover, there is a more prolonged catheter dependence in patients after a thigh graft infection, as compared with an upper extremity graft infection.